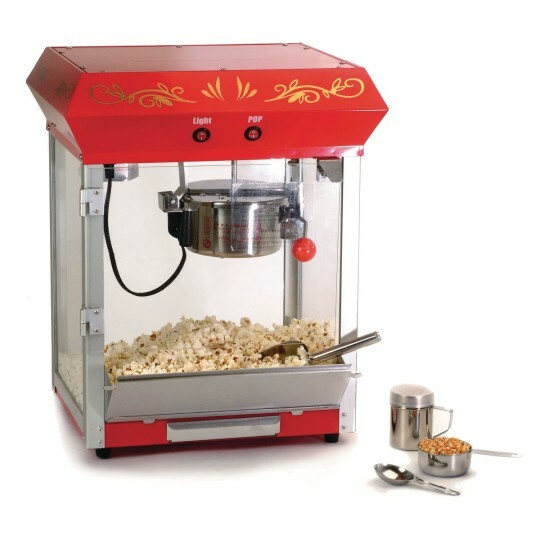 Popcorn maker features a 4-ounce stainless steel kettle with built-in stirring system, plexi-glass windows and door with warming light to keep popcorn hot. Makes up to 1-1/2-gallon of popcorn per batch. Popcorn machine has convenient stainless steel panel for easy access of popcorn. Recommended Mega Pop® corn, oil, salt kits for 4 oz. kettles. (Item #18814.) Windows and door are constructed of tempered glass. Warming light keeps popcorn fresh and hot. Stainless steel accessories include a salt shaker, popcorn scoop, measuring cup and spoon. 600 watts; uses 120v household power. Measures 14-3/4"W x 12"D x 21"H. Two switches: power on and warmer. BIG HIT WITH RESIDENTS STAFF AND VISTORS!!! This is such a great machine it really helps to bring smiles on the residents and staff faces. I love having popcorn Fridays great way to kick off the weekend. Thank you SS you guys ROCK!!!!! Who doesnt like to pop popcorn without a mess. This product is easy to use and very light. I use this for my residents on there movie night and we love it!! !